The nearly 700 acres of grassland that burned at our Sears Point Ranch in October have now greened up despite the paltry rainfall so far this winter. The fire here was not nearly as hot or intense as elsewhere, but it was hot enough to burn hundreds of fence posts over many miles of fences. To determine the extent of the damage, I spent a fair bit of time walking fence lines in November. The good news is that it allowed me to visit areas that I seldom get to, including a small drainage at the back of the property that supports some of the property’s few willow trees. I’ve seen them before, of course, but I had never poked my head underneath until then. It was a good thing I did. The fence line travels underneath the canopy and the fire had too, burning posts and causing the fence to loosen and sag. Caught in the fence was a seemingly dead red-tailed hawk, its wings caught in the loosened fence wire. In the eight years I’ve spent on Sears Point Ranch, it was the first time I’d seen something like this. I ventured closer and the hawk moved, craning its neck to watch my approach. I could see that I was not going to be able to disentangle the bird by myself so I retreated to avoid injuring it further or risking my own injury from its sharp talons and beak. I needed to find someone who could help. Away from the trees, I called Sonoma County Wildlife Rescue (SCWR) and, to my relief, they were able to send a volunteer who arrived within 20 minutes. That volunteer was Tony Gilbert, a retired attorney with a passion for rescuing raptors. I met Tony at the ranch gate where he transferred his gear bag into my truck and off we went to see what we could do. Once back at the site, we put on thick gloves from his bag that extended past the elbows and brought a sheet with which to cover the hawk. It was quickly evident that we wouldn’t be able to untangle the hawk’s wings from the fence without further stressing or injuring it. Fortunately, Tony had a multi-purpose tool attached to his belt that we used to cut the wire and then move the covered bird into a box. Without a lot of hope that the hawk would survive the night, we drove it to the wildlife rescue center and left it in their hands. 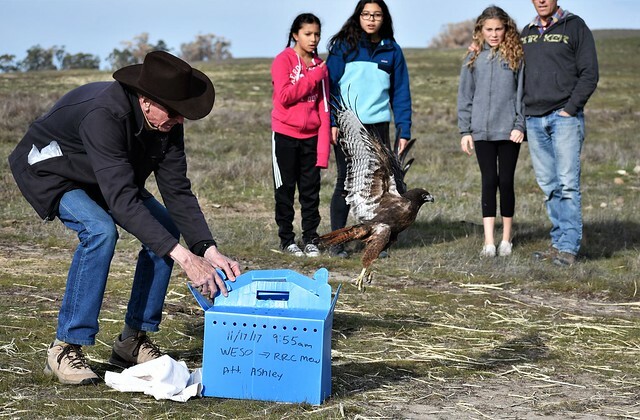 I called the SCWR a couple days later to see if it had survived and was told that yes, in fact, the hawk had seen the veterinarian and the injuries were not life threatening. It would need time to rehabilitate, but it might be able to be released to the wild. Staff said the bird was a character! Over the next six weeks, I kept in touch with the center and, in the week before Christmas, they told me that the hawk was ready for release. On December 22, Tony and I met back at Sears Point along with my kids, their friends, my mom and some SLT staff to do just that. We took the boxed hawk into the hills and set the box on the ground. With cameras set, Tony started to open the box and the hawk burst out and flew immediately — with purpose and strength — landing about 50 yards away on, yes, a fence post. It posed for pictures until a second hawk landed on a post nearby. Soon, our hawk took flight again, gaining altitude and then circling overhead before finally vanishing. I’m not sure my kids caught the full impact of this event as they quickly ran off to see the cows. But I am certain that it’s a memory that will be embedded in their minds. There is much good in the world and this was a small piece of it. Julian Meisler is Sonoma Land Trust's Baylands Program Manager. Julian: How wonderful, You certainly were in the right place at the right time. I certainly hope your kids remember this. What a thrill! Thanks to Julian and Tom and the SCWR... And especially to the hawk for its strength and beauty and for its trust. Ooops sorry - meant Tony, not Tom! !